Photographs and awesome camper van birdhouses by Jumahl. My mum has always been a bird lover, so when I was young we always had a birdhouse or two in the garden, plus plenty of fat balls and bird feeders hanging in the trees. I have followed in those footsteps and I still enjoy giving birds a good meal to keep them coming back to the garden year after year. This page provides a roundup of the best birdhouse building plans, DIY feeders, homemade birdbath tutorials, and a variety of the best and most creative products available to buy. So if you don't find a fun weekend craft project here to tempt you, you could always buy something wonderful instead! There is such an interesting array of different birds flying free all around you, and it's great to successfully attract them to your garden so you can observe them up close. I hope this page offers you plenty of inspiration and useful instruction. Photos and colourful houses by 4RB. An increase in human population causes an increase in the number of buildings, and more buildings means less land area left as natural greenery or forests. These areas are the natural habitats for birds, so as time goes on, there are fewer places for birds to set up their home. Birdhouses provide a home and shelter for birds even in small gardens, and they offer the birds a safe place to stay, which especially helps in built-up areas with limited green spaces. Birdhouses help wild bird populations flourish, and it's lovely to be able to watch birds in your garden too. Some birds build their own nests in trees, whilst others normally find naturally-occurring holes in trees to live in. Birdhouses mimic a hole in a tree, and as long as they are built well and provide enough space for them, birds will be very happy to make them their home. Instructions on how to build it and where to position it. Houses made from wood, coffee cans and cowboy boots! Specifications based on the type of bird you wish to make a home for. Projects include a gothic cathedral, a CCTV camera and a gourd design. Video tutorial for a smart plywood construction. Instructions for turning wood on a lathe to make an impressive house. Useful range of plans categorised by bird type. The basic box shape for small birds which can be built in an hour. This page offers plans for wren, owl, flicker & bluebird houses, amongst others. Straightforward design for a woodwork beginner. Diamond shape house made with wood and PVC pipe. Cool design with a raised roof that requires few DIY tools to make. Made mainly with 2x4 wood planks. A 2-storey masterpiece for under $20. Photo of a fun pottery birdhouse by Tony Alter. Before you make or buy a birdhouse, it’s best to research which birds are actually present in your local area, so that you can focus on the specific bird species you would like to attract to your garden. Once you know the type(s) of bird you would like to see occupying your birdhouse, it’s easier to buy one which is a suitable size and design for them. If you would like to build your own birdhouse instead of buying one, first be sure to research the specific nesting requirements of the birds you want to attract, especially with regards to the diameter of the house entrance. As a rough guide, the entrance opening usually measures around 1-1.5" in diameter, and is often positioned near the top of the house front, at least 5" from the floor. Another thing you’ll need to research is where to position the house within your garden so that it offers the best and safest home for the birds. With regards to the materials used for birdhouse construction, the best material to use is natural wood. Cedar and redwood are popular. Plastic, clay or stone are also possibilities, but it’s best to keep clear of metal because it heats up in the sun and can cause the inside of the house to overheat. You will find that some commercially-available birdhouses are made of metal, but if making your own I would warn against it. Be careful not to use pressure-treated wood at all, and it's best to use fresh natural wood rather than recycled wood because it's hard to know what surface treatments recycled wood may have had. Nails and screws are best for joining sections together for durability, rather than using glue or staples. The exterior decoration of the birdhouse is up to you. Obviously birds don't care what the outside looks like, but too much embellishment might scare them off! It's best to keep the design simple if you're unsure, and when painting the house use only non-toxic paint. Also, it's best not to paint the inside of the house, as birds can claw at the surface and paint dust will be created. Find out what birds are in your area. Including for kestrels and wood ducks. With 3D diagrams to help you. To be fixed to a post or pole ideally. Different compartments and tiers make up this impressive build. A simple shape with two entrances. Wooden homes with design variations. Fun idea for reusing a license plate as a roof. Simple construction of a diamond shaped home. With an exploded diagram and materials list. Simple box with a back that pivots open. 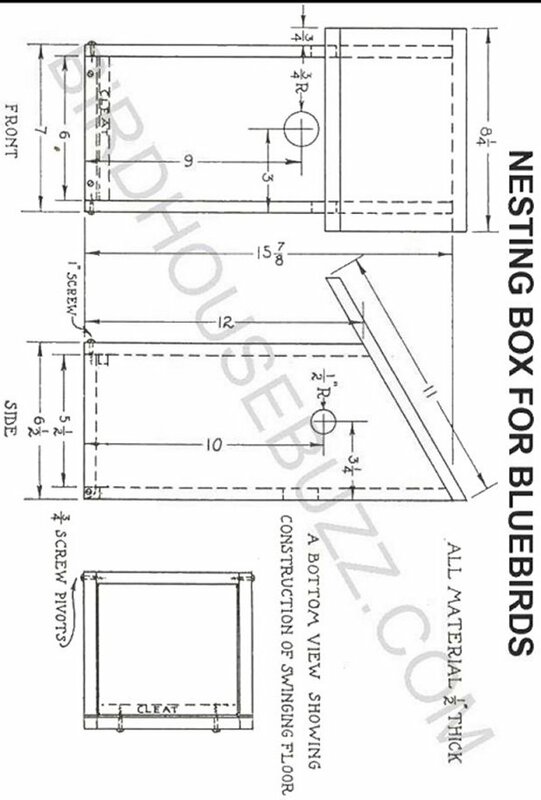 Download a detailed nesting box plan here. A great collection of plans including instructions on making predator guards. Swing-front opening for ease of cleaning. - Protection from predators: As noted above, you will need to research which position in your garden is best for your birdhouse e.g. how far off the ground it should be. In addition, the roof of the house should ideally overhang over the house entrance, preferably protruding by 2” or so to help protect against predators like cats. Click here for some good advice on this issue. - Ventilation: To allow some air flow within the house, a narrow gap or a series of holes is usually made between the roof and the walls. Birdhouse plans should include this so just follow the guide. - Water drainage: Any water or moisture needs a way to escape so drill a few holes in the base to allow it to drain out. - Protection from the elements: An important feature of a birdhouse to provide a dry and comfortable space for birds, and this means keeping the rain out. A slanted roof which overhangs all sides is the best protection, as the rain will just roll right off. The roof should definitely extend over the house entrance to stop rain getting inside through this opening. It’s also a good idea to attach the sides of the house to outside edges of the base piece (the floor), so that water doesn’t seep in through the seams in the sides where the pieces of material are joined together. In fact, it's even better if you can recess the floor section by a small amount so that the walls slightly overhang downwards past the bottom of the floor piece. Always position the house so that the entrance is not facing into the incoming wind. - Perches: It is highly recommended that perches are not added to outdoor birdhouses, even though it may seem traditional to have one, as birds don't in fact need one and they are often used by predators to gain easier access to the house - not good! - The Finish: Make sure there are no spiky or sharp bits on the house, or nails sticking out. No need to sand the interior completely smooth though as birds actually like rough inside walls so that they can climb up them more easily. - Cleaning out: A hinged wall is the most convenient way of allowing easy access for you. You’ll need to clean the house out after each brood of birds leaves the nest so that it's clean and ready for the next brood. The hinged wall should be able to be securely closed when the house is in use. Another common way to allow you easy access to the interior is simply to attach one of the birdhouse walls with screws during construction so that they may be unscrewed later when you need to remove the wall to clean. - Mounting: When attached to a tree or pole, the house should be secure and not wobble. You'll soon know if the birdhouse is good enough or not anyway, because birds simply won't use it if it's not fit for purpose - they're fussy like that! Unique and awesome painted house series. A display of modern designs. A cool art installation idea. Always a good resource for ideas. Fairy houses, rustic houses made from reclaimed wood & more. Sculptural modern art for your garden. Awesome idea, made from wood and sheet metal. Made-to-order houses in original designs. Winnebago, fire engine and VW camper designs. Photographs and very cool birdhouses by Jeff Canham. Photo and simple wooden birdhouse by Pete Toscano. Give these creepy nocturnal creatures a home too! 2D feeder with an apple suspended in the centre. Bottle feeder made using melted plastic spoons. Including a bread house and a pumpkin feeder. Made using a rhubarb leaf mould. Bird feeders made from pinecones. Made from a pop bottle and a wooden bowl. Photo and bird seed 'Welcome' garland by Full Circle - Click here for instructions. Photo of a cute tractor house by Jerry.